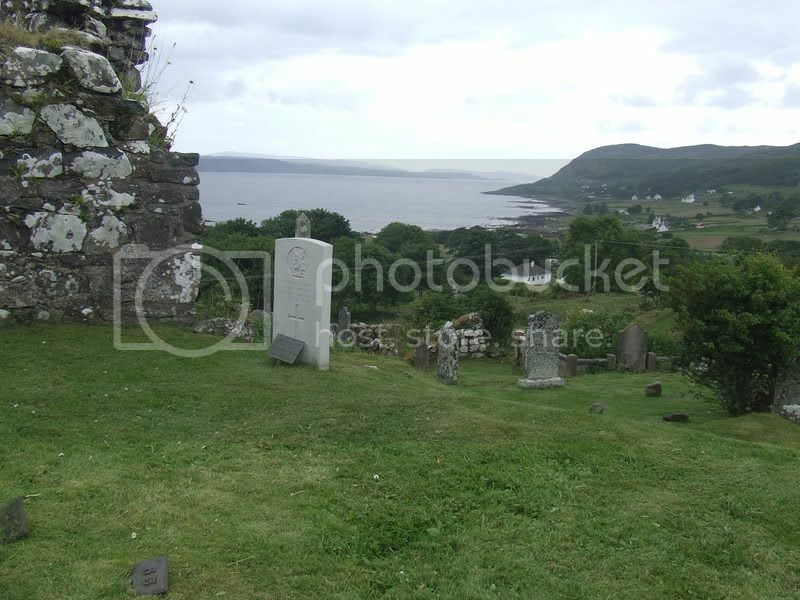 This ancient cemetery on a hillside contains 2 CWGC graves. 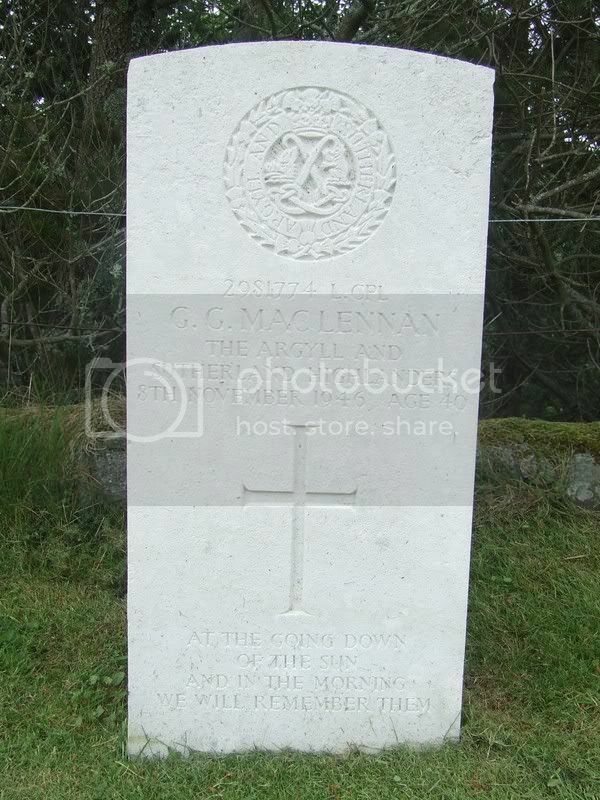 Additional information: Son of John and Mary MacLennan; husband of Flora Emily MacLennan, of Bearsden, Dunbartonshire. The story has emerged of how two Warwickshire brothers who fought in the Second World were eventually buried together in a remote area of Scotland. Last month we carried an appeal from Leamington historian David Eason for information about Norman and Douglas King of the Warwickshire Yeomanry. He wanted to complete their story for the regiment’s roll of honour. Now relatives have come forward to fill in the blanks about the brothers. Trooper, Norman “Buster” King died at sea on Sunday June 2, 1940, aged 21, while on board the SS Arandora Star. The ship was sailing from Liverpool to Canada with hundreds of German and Italian prisoners of war and civilian internees when it was hit by a torpedo fired from a German submarine. More than 800 people were lost, including Norman. 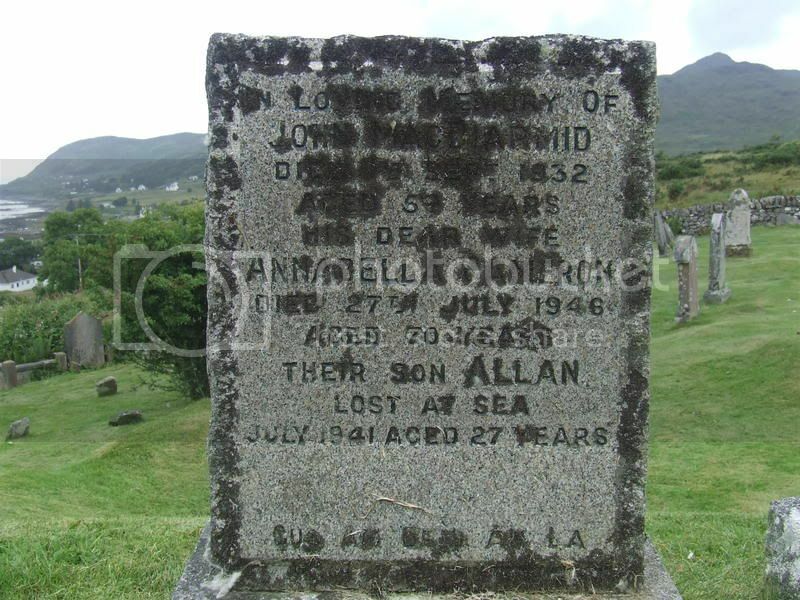 On Wednesday August 21, 1940, a Kilchoan resident who was on leave from the Merchant Navy was walking along the hills and discovered Norman’s body washed ashore, Norman was buried later that day at St Congan’s church cemetery, Kilchoan, Ardnamurchan in Argyllshire, Scotland. Douglas “Happy” King survived the war and passed away in 2005. 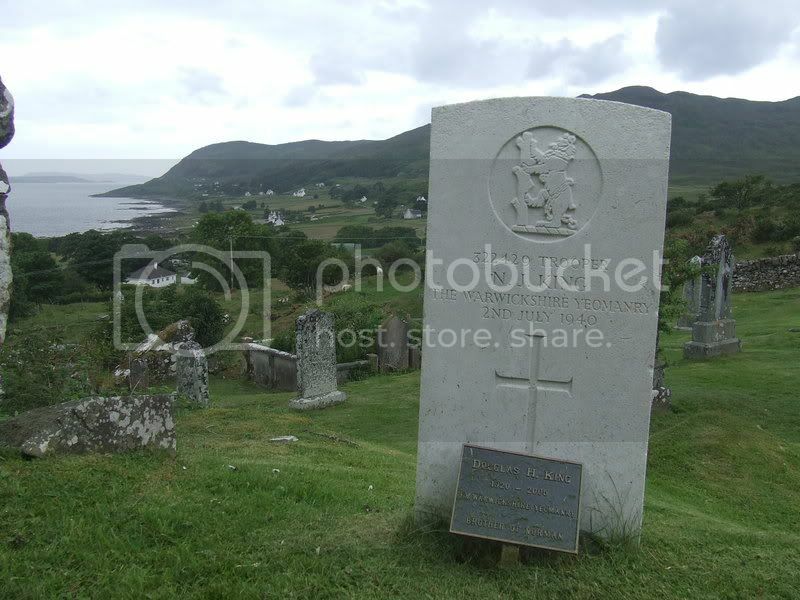 His wife Beryl for “57 happy years” gained permission from the Scottish War Graves Commission and the local minister had Douglas’s ashes interred in Norman’s grave. A plaque commemorating Douglas stands at the foot of his brother’s headstone. Norman was born in 1918 at Eltham in South East London. The family then moved from London to Southam around 1925 when their father was appointed divisional surveyor for Warwickshire District Council and then to Leamington where both Norman and Douglas were educated at the old Leamington College for Boys in Binswood Avenue. While at the college, Norman and Douglas were very good swimmers and played water polo and rugby. They both played for the college and the Old Leamingtonians, for which Douglas was captain until 1936. At the outbreak of war both Norman and Douglas enlisted into the Warwickshire Yeomanry in September 1939, when they were separated. Norman spent a short time in France before being trained as a prisoner of war guard at Tidworth in Hampshire. Douglas went with the regiment to Egypt with B Squadron, seeing service in Palestine, Lebanon, Syria, Iraq and Egypt. On October 22, 1942, the regiment supported the 6th New Zealand Brigade during the Battle of El Alamein and then afterwards saw service in Italy. Norman is commemorated on the Leamington war memorial; the Leamington College for Boys, 1939-1945, war memorial plaque, located at Leamington North School Courtyard, Sandy Lane, Leamington; and the Warwickshire Yeomanry, 1939-1945, war memorial plaque, located at St Mary’s church in Warwick. David Eason would like to thank Mrs Beryl King, Dr Cowley, Mr Jon Haylett and the Tank Museum at Bovington for all of their help in completing the story. What a great, sad and heart-warming story. 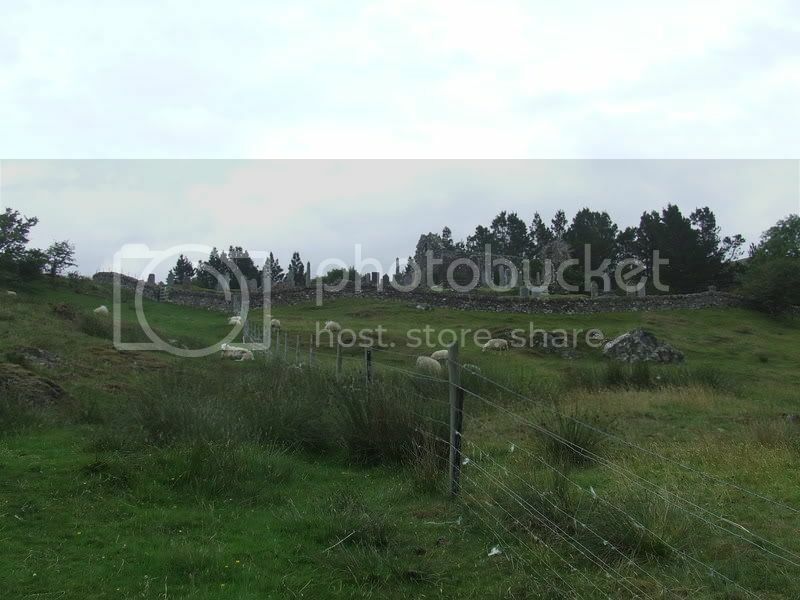 And stunning photos to go with it DerekR. It's amazing how much family history is hidden away in a small plaque next to a CWGC headstone. 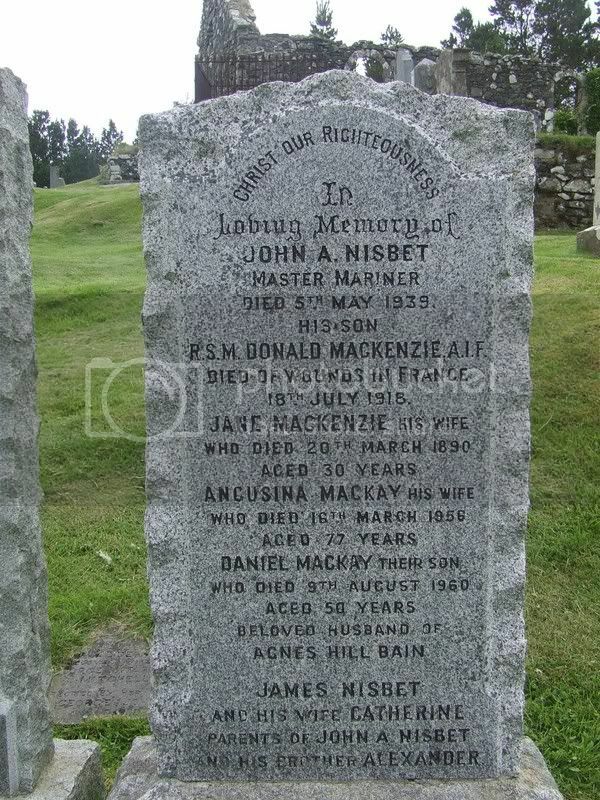 Son of John Alexander Nesbit, of Kilchoan, Ardnamurchan, Argyll, Scotland; husband of Jane MacKenzie Nesbit. I think the Jane referred to here is Donald's mother. There is no mention of a wife in his service file. 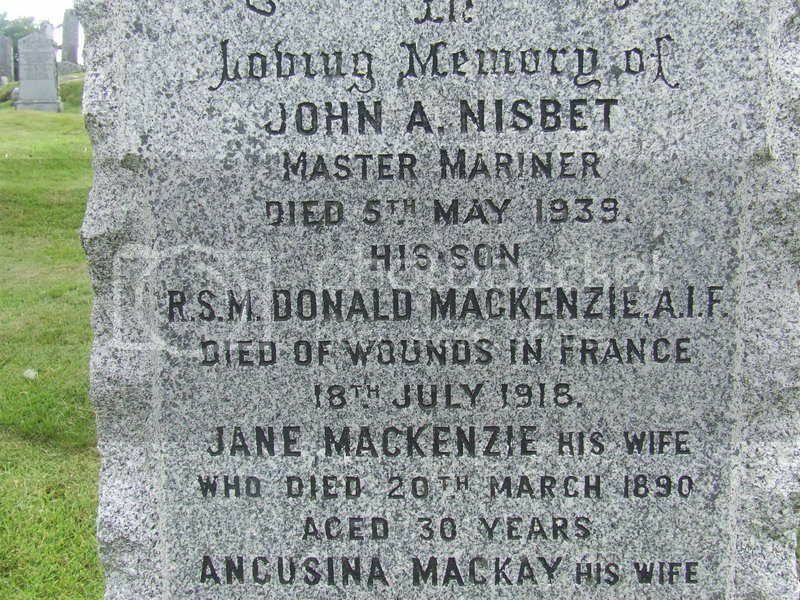 Nesbit/Nisbet's story and details of his death have just appeared on a "revitalised" thread on the Great War Forum. From Lance-Corporal to Regimental Sergeant-Major was his record, and there was no better soldier ever left Australia. 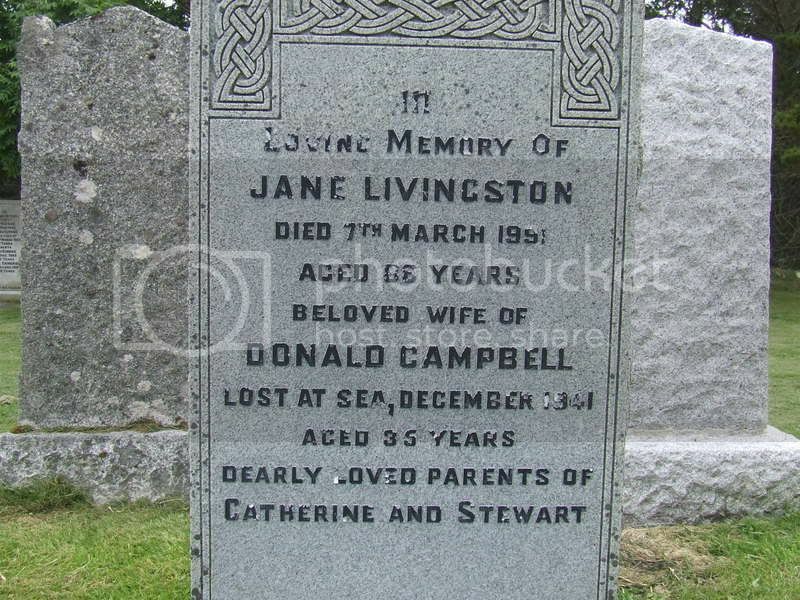 Born in Scotland, he came to Australia early in life, and left in June, 1916, with the Battalion. He went through the campaign and did fine work up to the day of his death. Thanks for posting this info Ken.